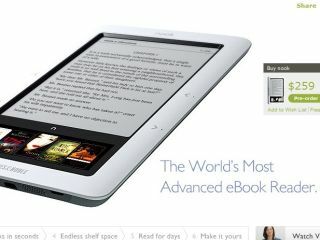 US bookstore Barnes & Noble's new ebook reader - the Nook - is under threat after a rival hardware developer claimed that the design was poached. The Nook uses a dual screen approach to ebook display, with the lower half of the device a capacitive LCD using an Android interface and the upper half a 'normal' ebook display. But Spring Design launched a device - the Alex - with a similar layout the day before the Nook - although it has a larger lower screen that sends internet pages up to the e-ink screen for low battery reading. Spring Design has said that Barnes & Noble's device infringes on its patents, and claims that the two companies were engaged in conversation about the device in the year leading up to its launch. However, the whole process was under NDA, and the dual release has prompted Spring Design to file a trade secret lawsuit. The two devices are different in design, and slightly different in function (the Alex has a full Android internet browser, while the Nook simply has touch navigation) but the fact they were released so close together means there's something decidedly fishy about the whole situation.